We have arrived in Atlanta for my second Specify Colour with Confidence workshop this Spring (it starts tomorrow). After we left Toronto, we flew to Little Rock for a meeting and yesterday before our flight back, we drove around and I snapped a photo of this blue grey house with crisp white trim and a fabulous red front door because I love the way the homeowner planted matching Azaleas out front. Nothing brings grey to life faster than a striking colour like red! And red is trending again. 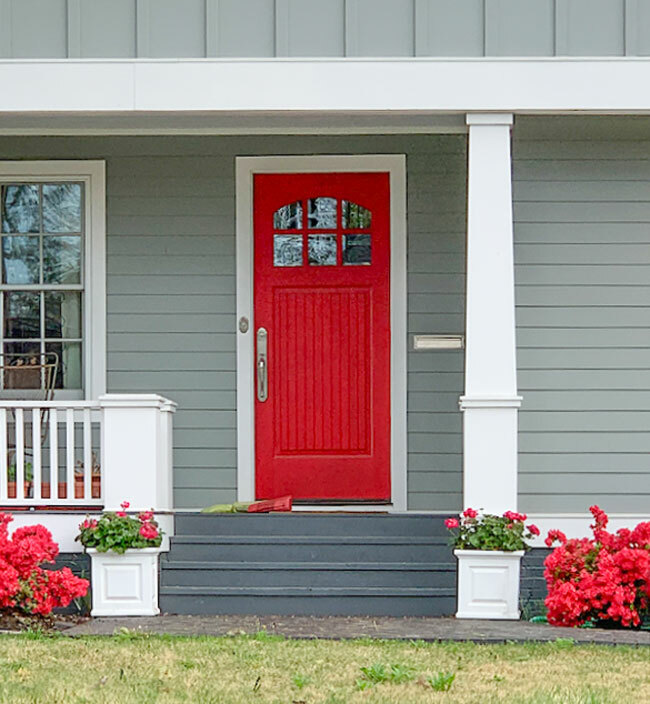 Spring is the perfect time to update your front entrance. To bring some new energy and curb appeal to your home after a long winter. It’s a relatively easy but impactful project. But I suspect that people generally spend a lot more time spinning in circles deciding on the right colour for their front door than they do actually painting it. My front door posts are always among the most popular. People clearly shop for front door colours online, so I thought I would give you some new inspiration since it’s the right time of year. You really do need to take the surroundings and the colour of your house into consideration to find the perfect colour. You can push the clean and dirty rule a little bit with a front door colour, but if you go too clean on a taupe, or beige, brick or stone house, it won’t look harmonious. In general, it’s a good idea if you have an earthier exterior, to look for a much more muted or “dirty” version of the colour you like to test for your front door. Trending deep forest greens often work well for brick and stone houses (below). Greens connect readily to the landscape, so they tend to settle in and look right at home. And different greens play well together. 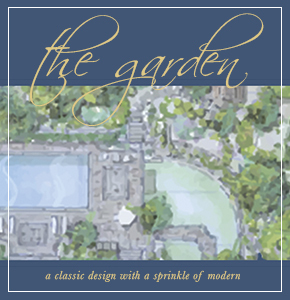 If you have an earthy house, often all greens and some white or cream looks best for plantings. But you can also use some richer golden yellows, rusty oranges, plummy purples and deep burgundy reds in your planters and landscape. Muted eggplant is another good front door colour to try with any brick, stone or earth toned house. There are lots of pretty purple and violet flowers you can plant to coordinate. And if you like blue, you may be able to go with a more subtle slate blue with an earthier house like this below. For a similar look try SW 8148 Azurite. Image from Home Stratosphere. If you have a lighter colour on your exterior, with white or cream trim, you have a lot of options for your front door colour. Too many maybe, it can get hard to narrow it down. One place to look if you want to spruce up your front entrance is to your interior palette for inspiration. 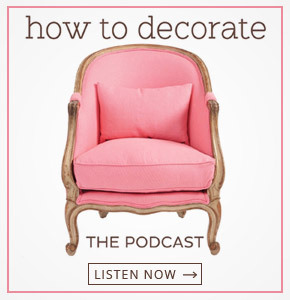 But what if decorating your interior is the next project? And right now, your front entrance is really what needs love? If you’re not sure where to begin, you can arrive at just the right colour by picking out some decor for your front porch first. A pillow for a chair or bench, or a colourful outdoor rug is a great jump off point for a front door colour. Often, all it takes is repeating the colour with vibrant flowers in your landscape and planters to be able to pull in a fun new colour. I had fun putting together some inspiration boards, complete with sourcing links below to help inspire you to refresh your front entrance for spring. Here’s a vibrant orange pulled from an outdoor accent pillow from Etsy. Rattan furniture of any kind is on trend right now, especially outdoors. It’s both classic and casual. This chair is from Lulu and Georgia, you can find it here. A combination of vining nasturtiums and succulents would look great with this hot orange to complete a brand new look for your entrance. True blue flowers are hard to find, but there are some. Some varieties of delphiniums and hydrangeas are quite blue. But you don’t have to match them perfectly. Any flowers in the blue range will read as a nice repeat of this pretty blue. This kind of clear blue happens to look lovely with fresh green foliage anyway.A large fern in a classic black planter is one of my favourite simple solutions for a front entrance planting. The pillow is also from Etsy, you can find it here. And the classic weathered wicker chair is from Birch Lane here. This door colour is a beautiful twist on forest green with a bit more teal to it. BM Dragonfly is in my updated VIP Collection of colour boards. Deep greens look amazing with almost any flower colour. Dragonfly picks up some of the pretty blue greens of blue hostas and looks great with warmer greens too. I really like this colour with a bit of black and lots of white. The outdoor chair from Williams Sonoma Home looks very upscale. And this pillow is also from Etsy here. Pink front doors are trending like never before. It’s so great how the world has opened up to this fresh and romantic colour. I would not be able to resist pairing it with old fashioned pink roses. Maybe climbing ones. And how fun would it be to have a swinging chair on your porch? Well you can get this one here. The pillow is from Etsy here. Purple is one of my favourite colours for a front door. It’s a decadent jewel tone that always looks rich and luxurious. This purple is pretty clean, but as I said, there are lots of muted, dirtier versions of purple leaning a bit more towards brown and grey that work beautifully with earthier palettes. This door colour was pulled from this colourful outdoor rug that you can find here. The modern outdoor rocker is perfect for the porch from Williams Sonoma Home here. And one of my favourite purple flowers is heliotrope, they smell amazing. Are you painting your front door this year? If you’re just not sure and you would like me to layout some beautiful front door colour options for YOUR house, I can help with my convenient Front Door Colour Exterior Edesign Consultation here. Jo Chrobak an interior designer and architect came all the way from the UK to my Toronto course! She had been following me for years and finally this was the right time! Having professional architectural and interior design training means that everyone expects you to just be good with colour. Yes we have an ‘eye for design’, but that doesn’t mean we get it right 100% of the time. Thanks to this unique and totally original way of looking at colour that Maria teaches, I can now say that I can get it right every single time and I can confidently back up my argument with facts rather than fluff. Thank you for helping me see colour in such a unique way. So happy to read this. We are having a new red front door installed on our gray house today! Great information …as always! Seeing the decor choices is a great way to really make the color pop! Absolutely take into effect your area and neighborhood! Inspired by the homes in New Orleans, a friend of mine painted her Victorian townhouse door, located in a classic, very preppy, northeast neighborhood, a shade of purple. In New Orleans, it would have been great but in her area, it read ‘frat house’, ‘off campus college students’ or ‘hippy’. I think that first front door color matching the azaleas looks awful – like matchy matchy furniture sets. And it makes that beautiful weeping Japanese maple, which is probably normally the star of the yard, look dirty. Perhaps matching that Japanese Maple would have been better for year round knowing the azaleas are beautiful enough to hold their own when they are blooming. Just my thoughts…..
That wasn’t my favorite front door, either. My landscaper told me to chose plants/flowers that were complementary to the house color, rather than trying to match. Two different looks, I suppose, according to one’s taste. I thought the same. And the azaleas are in bloom for relatively short time. I need to repaint our front door, which is mullioned glass at the top half. The house is an orange recycled brick. I have been trying to come up with a color that will go with the black roof and white trim. I’m tired of the boring black white and red look. I like the deep green you show here. What about something a bit lighter and more blueish. Not turquoise, but a muted green blue? The storm door, which is necessary, is white, would you leave it white, as the trim around it is white, or paint it blue, too? It sounds like we have similar brick. We painted our door and shutter a fire orange color. It looks amazing. Paint the storm. It’s not really something to accentuate and with it white that’s all one would notice. the trim can probably stay white. I may do that, if I can convince my husband. there is a thin trim around the door that i will paint, too. That way whatever color I choose has the most impact. Ohhh… going to order those pretty teal pillows for my wicker rockers on my front porch. Will look great with my SW Rookwood Blue Green door, flanked by two variegated dark green/silver mother-in-law tongue plants. Nothing like a welcoming front porch! Nice ideas but for me it is a little too matchy! I like shades of green with any front door color! Yes you could bring a couple pops of color to match the door but too much is too much! Just IMHO! My front door needs paint but…I can’t decide so for now am going to go for same as trim. House is painted BM Hawthorne, trim is Mayonaise. But…we have as orange/red roof, which also needs to replacing. The yellow is a new color so one thing that I think will be super fun…how totally different all the flowers I planted will look. Previously the house was a sad dark, blue. So the values are totally different. I have already started adding a lot of white flowers, but hated them with blue color. I have a ton of soft pink flowers, hoping it will be romantic. LOL, my front door has been forest green for 15 years! I’ve always loved Forest Green and have it represented in my home in varying degrees since it was first popular back in the late 90’s. In fact, my grown 26 y.o. daughter now has my old Forest Green sectional in her condo, and she loves it. She’s right on trend with a hand-me-down, lol. She picked fresh wall color in SilverPoint paint by Sherwin Williams, which is a lovely LIGHT gray with a hint of steely green. Her place looks youthful, bright and current. An amazing number of colors look good with Forest Green, so she will be able to change out her secondary “software” as time goes on to stay fresh. Maria has helped both of us see the undertones and choose paint wisely. We don’t have a lot of money to make mistakes! Thank you Maria! P.S. : Can someone please tell me how to post my photo in the avatar box? My favourite is the pink! How dreamy! I’m unsure of whether it would suit a cottage style better than a rancher though. Do you think it would be complimentary to a green beige siding? You are getting a name for yourself internationally. Perhaps, you should host seminars in Europe. Wouldn’t that be an adventure, Maria?! I have a magenta front door. It makes me smile every time I come home. What a great post!I’m still conflicted on whether or not to paint my natural dark oak on my old “georgian” house. I love the roycroft green and am using it for fencing instead of black. You gave some great choices for earth-toned houses. It drives me nuts when I see doors that totally clash with the rest of the house. Too much pinterest and no regard for undertones especially with dirtier toned houses. One can still have the colour family, just not the exact colours often shown. You help people get it right the first time. Thank you!. Our dilemma is our siding is an ugly pink-beige which gets a LOT of coverage on your blog (literally, lol.) It’s probably considered taupe but either way it’s bleh! The original shutters were a medium muted green. (The original owner liked beach colors.) We painted the shutters black and honestly on a cloudy day the siding looks more tan. Back to the front door… it’s metal and was faux painted to look like wood. After seeing all these painted doors I’m intrigued. Thought about black recently but would love other opinions. Do I just re-faux the wood look? Ideas? I clicked to see if you included my favorite door color, and you did! Purple is wildly underappreciated.